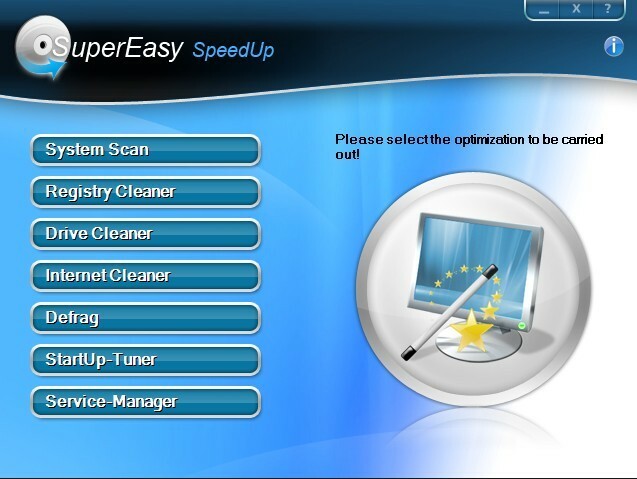 SuperEasy SpeedUp is a modern, particularly capable and intuitively operable tuning suite for Windows optimization, which consists of different modules. 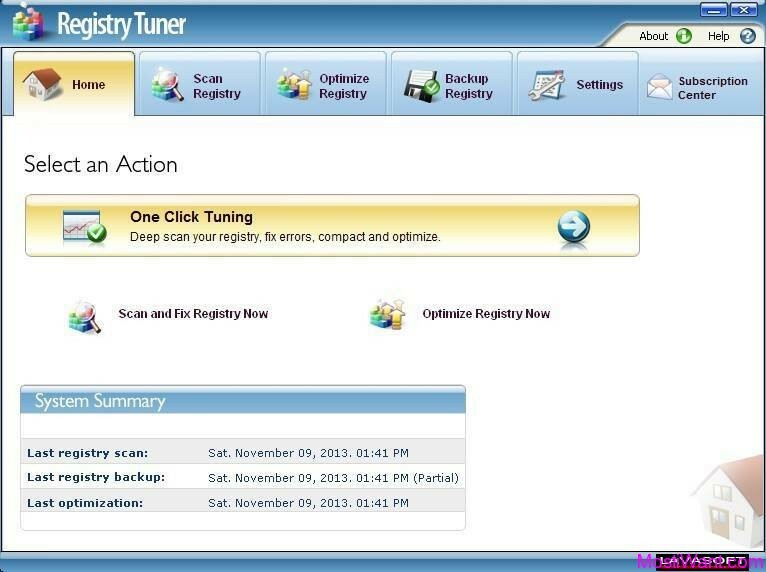 The System Scan tool checks your system and cleans it in manifold manner. 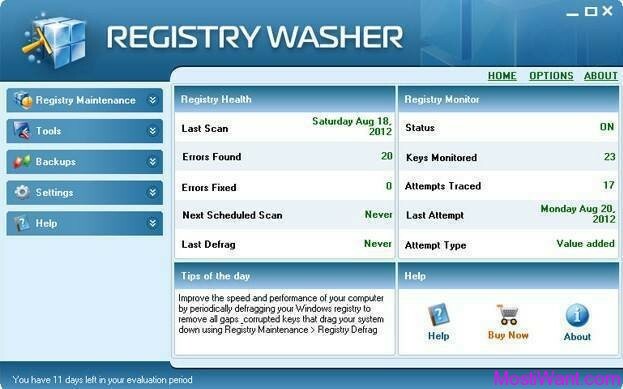 The DriveCleaner removes superfluous data from your hard disks; the RegistryCleaner cleans your system from decelerating entries and the InternetCleaner removes revealing surf traces. Other modules optimize your hard disk access, scan unnecessary autostart entries and disclose the services that Windows loads to the memory during boot up. As a result, you purify your whole system, get back valuable memory, and get your Windows going and elicit more performance from your PC. Garbage data no longer blocks you hard disks and main memory or slows down your computer.SuperEasy SpeedUp lifts the speed limits of the past and brings your Windows to top form – without loosing carefully elaborated settings and without having to install programs and system anew. How to download SuperEasy SpeedUp Basic with Serial Number for free? SuperEasy SpeedUp Basic normally costs around $13 for purchase, and comes with a 10+30 days full version trial. Now, For a very limited time, the interested users are now entitled to download the latest full version SuperEasy SpeedUp Basic with free Serial Number. 1, Visit the supereasy.de giveaway page, and enter your contact details in the registration form below. 2, They will sent you a confirmation link in the eMail address that you’ve given. 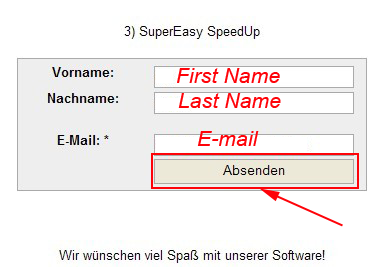 Check your mailbox and click on the confirmation link to confirm your registration for the free version “SuperEasy SpeedUp Basic”. Then you will get SuperEasy SpeedUp Basic Free License Key in a second email. Copy the Serial Number. 3, Download SuperEasy SpeedUp Basic here. Install and active it with the serial number you received. 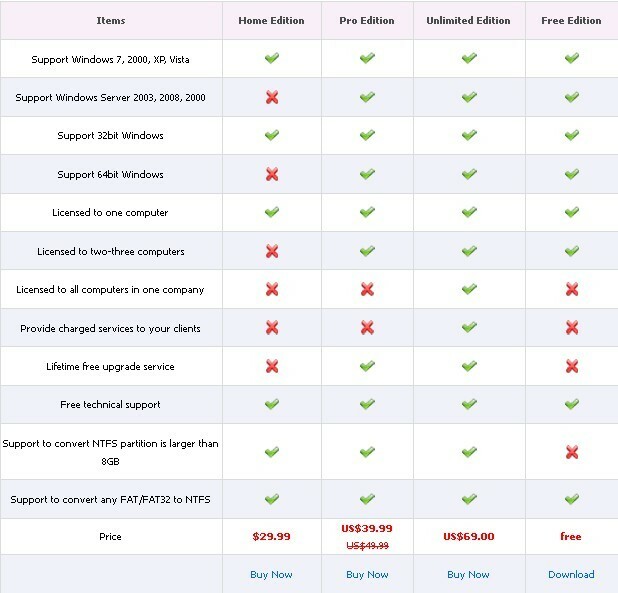 System requirements: Windows XP/Vista . NO Windows 7 support. Thanks erosdiver from Germany for informing us about this promo.